There is a body of films that are set on the planet Mars. In the late 19th century, people erroneously believed that there were canals on Mars. Into the early 20th century, additional observations of Mars fed people's interest in what was called "Mars fever". One of the earliest films to be set on Mars was the short film A Trip to Mars (1910), which was produced by one of Thomas Edison's film companies. In the 1920s through the 1960s, more films featured Mars or extraterrestrial Martians. 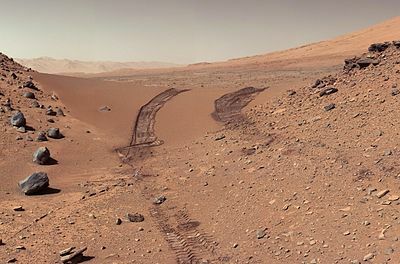 In the 1960s and 1970s, the Mariner program and the Viking program revealed new scientific details about Mars that showed little prospect for life. The Guardian said, "These disappointing discoveries changed the place of Mars on humanity's mental map. Films began to reflect this." Films such as Total Recall (1990) and Red Planet (2000) focused more on the colonization of Mars by humans. Cydonia (/sɪˈdoʊniə/, /saɪˈdoʊniə/) is a region on the planet Mars that has attracted both scientific and popular interest. The name originally referred to the albedo feature (distinctively coloured area) that was visible from Earthbound telescopes. The area borders plains of Acidalia Planitia and the Arabia Terra highlands. 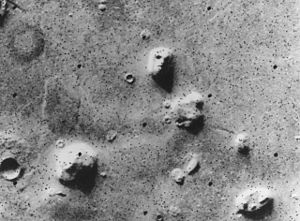 The area includes the regions: "Cydonia Mensae", an area of flat-topped mesa-like features, "Cydonia Colles", a region of small hills or knobs, and "Cydonia Labyrinthus", a complex of intersecting valleys. As with other albedo features on Mars, the name Cydonia was drawn from classical antiquity, in this case from Cydonia or Kydonia (/sɪˈdoʊniə/; Ancient Greek: Κυδωνία; Latin: Cydonia), a historic polis (or "city-state") on the island of Crete. The boundary between the two regions is quite complex in places. One distinctive type of topography is called fretted terrain. It contains mesas, knobs, and flat-floored valleys having walls about a mile high. Around many of the mesas and knobs are lobate debris aprons that have been shown to be rock glaciers. Some liquid water may occur transiently on the Martian surface today, but limited to traces of dissolved moisture from the atmosphere and thin films, which are challenging environments for known life. No large standing bodies of liquid water exist on the planet's surface, because the atmospheric pressure there averages just 600 pascals (0.087 psi), a figure slightly below the vapor pressure of water at its melting point; under average Martian conditions, pure water on the Martian surface would freeze or, if heated to above the melting point, would sublime to vapor. 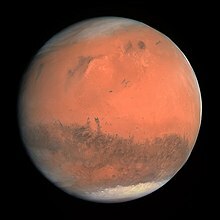 Before about 3.8 billion years ago, Mars may have had a denser atmosphere and higher surface temperatures, allowing vast amounts of liquid water on the surface, possibly including a large ocean that may have covered one-third of the planet. Water has also apparently flowed across the surface for short periods at various intervals more recently in Mars' history. On December 9, 2013, NASA reported that, based on evidence from the Curiosity rover studying Aeolis Palus, Gale Crater contained an ancient freshwater lake that could have been a hospitable environment for microbial life. Estimating carbon in the Nili Fossae plains region of Mars from orbiters (2 September 2015). Evidence for carbonates on Mars was first discovered in 2008. Previously, most remote sensing instruments such as OMEGA and THEMIS—sensitive to infrared emissivity spectral features of carbonates—had not suggested the presence of carbonate outcrops, at least at the 100 m or coarser spatial scales available from the returned data. Curiosity's view of Martian soil and boulders after crossing the "Dingo Gap" sand dune (February 9, 2014; raw color). Martian soil is the fine regolith found on the surface of Mars. Its properties can differ significantly from those of terrestrial soil, including its toxicity due to the presence of perchlorates. 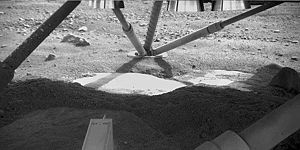 The term Martian soil typically refers to the finer fraction of regolith. On Earth, the term "soil" usually includes organic content. In contrast, planetary scientists adopt a functional definition of soil to distinguish it from rocks. Rocks generally refer to 10 cm scale and larger materials (e.g., fragments, breccia, and exposed outcrops) with high thermal inertia, with areal fractions consistent with the Viking Infrared Thermal Mapper (IRTM) data, and immobile under current aeolian conditions. Consequently, rocks classify as grains exceeding the size of cobbles on the Wentworth scale. A Ring mold crater is a kind of crater on the planet Mars that looks like the ring molds used in baking. They are believed to be caused by an impact into ice. The ice is covered by a layer of debris. They are found in parts of Mars that have buried ice. Laboratory experiments confirm that impacts into ice result in a "ring mold shape." They are also bigger than other craters in which an asteroid impacted solid rock. Impacts into ice warm the ice and cause it to flow into the ring mold shape. These craters are common in lobate debris aprons and lineated valley fill. Many have been found in Mamers Valles, a channel found along the dichotomy boundary in Deuteronilus Mensae. They may be an easy way for future colonists of Mars to find water ice. An modification of the formation of ring mold craters being formed by impact into an ice layer was presented at a Planetary Science conference in Texas in 2018. This new hypothesis involves mantle layers. Image:Ring Mold context image.JPG|CTX context image for next image taken with HiRISE. Box indicates image footprint of following image. Image:Possible Ring Mold Crater.JPG|Possible ring mold crater, as seen by HiRISE under the HiWish program. Crater shape is due to impact into ice. A Martian scientist or Martian researcher is a hypothetical Martian frequently used in thought experiments as an outside observer of conditions on Earth. The most common variety is the Martian anthropologist, but Martians researching subjects such as philosophy, linguistics and biology have also been invoked. The following extract from an essay by Richard Dawkins is more or less typical. :A Martian taxonomist who didn't know that all human races happily interbreed with one another, and didn't know that most of the underlying genetic variance in our species is shared by all races might be tempted by our regional differences in skin colour, facial features, hair, body size and proportions to split us into more than one species. ... that Mars' gravity is affected by many negative free air gravity anomalies on its surface? ... that the Martian dunes of Ogygis Undae consist of two different sand types, and look similar to the dunes in Grand Falls, Arizona?